Innovative business accounting software for single user start-up and small businesses. An essential part of any business is to keep track of your finances - and as a small or start-up business you do not need all the bells and whistles of a more expensive accounting system... Sage Pastel Xpress Start-Up does just that. Our Xpress Start-Up business accounting software will give you the tools to easily and effectively keep your financials in check, leaving you to run and grow your business. Sage Pastel developed our business accounting software with your business environment in mind. Only the features that you need are included, without limiting you when your business starts to grow. 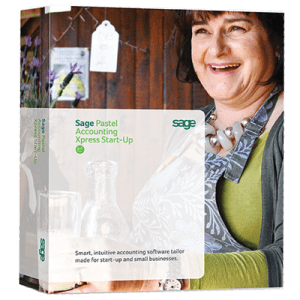 Sage Pastel Xpress Start-up business accounting software comes with a single user and company licence. You will be able to securely store 5 years of transactional data while being able to process the current, as well as previous, financial years. You can create a maximum of 30 cash books, and the inclusion of a General Ledger goes without saying. for more information, please contact on of our expertly trained Sales Consultants to advise whether this product will be suitable for your business. We take pride in giving our client the best advice on Sage Pastel software, to make their business grow and succeed. * Sage Pastel Xpress Start-Up business accounting software carries 30 days free support. For continued telephonic support purchase Sage Pastel Support, on an annual basis.